​(Left) In the darkness of early morning, before the road race began, the Muslim stall was ready to provide runners with bottles of water. 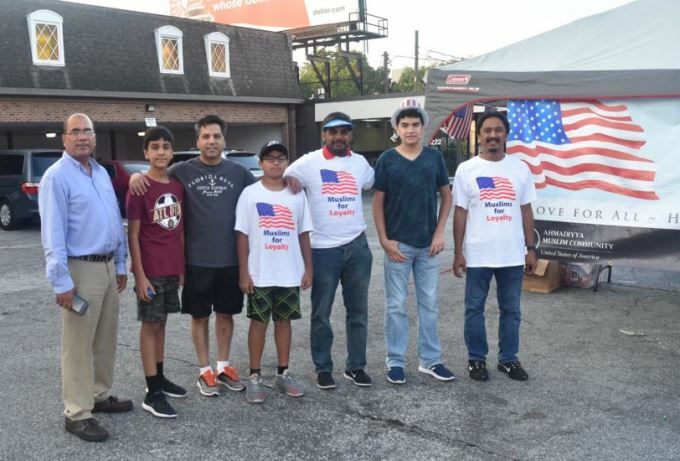 The Ahmadiyya Muslim Community – Georgia Chapter set up a stall at the Peachtree Road Race in Atlanta on July 4th, and manned it from 6am to noon, both to support the runners and to show their patriotism, as they have done for the past several years. The stall was at 1891 Peachtree Road and was open to everyone. 1) Several Ahmadiyya Muslims ran in the race. 2) Others, including children, handed out patriotic paraphernalia, including mini-flags. This was to demonstrate love and loyalty to this Homeland on Independence Day. According to Islamic teachings, love of one's country is a part of faith. 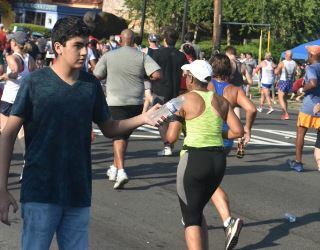 3) Children and adults at the stall also handed out water bottles to support the runners, for the Prophet said, "God is kind and likes kindness in all things." The Ahmadiyya Muslim road race team.